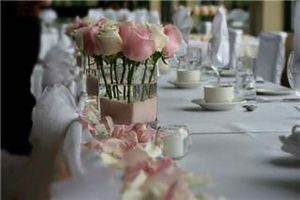 Flowers – beautiful floral centerpieces for guest tables, bouquets and boutonnieres, flower urns at the ceremony, flowers on the edge of ceremony chairs or flower petals down the aisle. Flowers are a key component of a wedding or an event, and an expression of what you love. They are a focal point for your decor and a key component of your guests delight. Beautiful flowers add colour, texture, and beauty. Most importantly, they can drastically enhance the look of a room and transform a venue. Beautiful wedding bouquets created from fresh gorgeous flowers, from simple to elegant, hand tied or cascading, also corsages - wrist & pin on - and boutonnieres to recognize the special people in your life. Stunning fresh flower centerpieces from simple to elegant, designed for any event: weddings, corporate events, fundraisers, galas, bridal or baby showers, private parties & Christmas events. 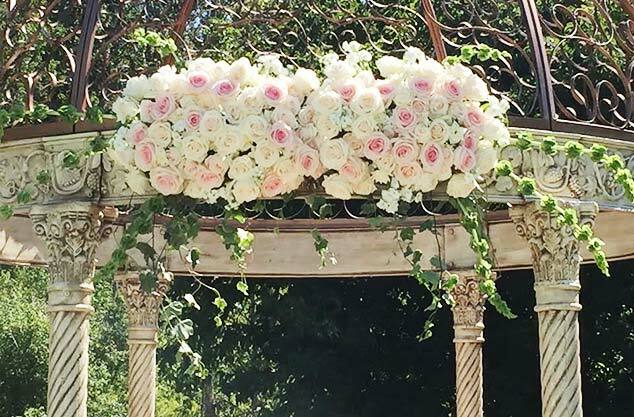 Gorgeous gazebo flowers, floral arbours, chuppas, signing table flowers, ceremony urns, pew flowers or flowers tied to chairs lining the aisle of the ceremony & rose petal designs down the aisle. Show-stopping flower arrangements for the venue, on the buffet tables or cocktail tables. Also, floral arrangements for Get Well, Romance, Just Because, Birthday, Sympathy or Funerals. What flowers are in season January to December? Q. What flowers cost the least and what flowers cost the most? A. Certain flowers cost less, typically because they are easy to grow and are produced in abundance throughout the year. 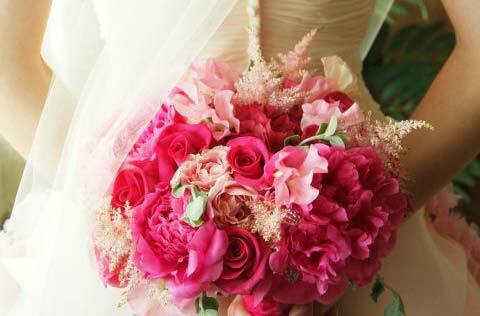 Some examples of inexpensive flowers you might choose for your wedding: carnations, baby’s breath and alstroemeria. Others are especially cheap at certain times of the year when they are in season, like chrysanthemums in the fall. Colour variations may also affect the price. Flowers are much more expensive when they are difficult to grow because they are produced in smaller quantities. An example is the peony, which takes two years for the plant to produce a lot of blooms. Orchids and calla lilies are also among the higher-priced varieties. If you choose these for your bouquets or boutonnieres or centerpieces, you’ll see the cost rise accordingly. However, don’t let price alone be your deciding factor. A single peony might be expensive, but it fills out a centerpiece well and can make an impact. Q. What is the average cost of flowers for a wedding? A. 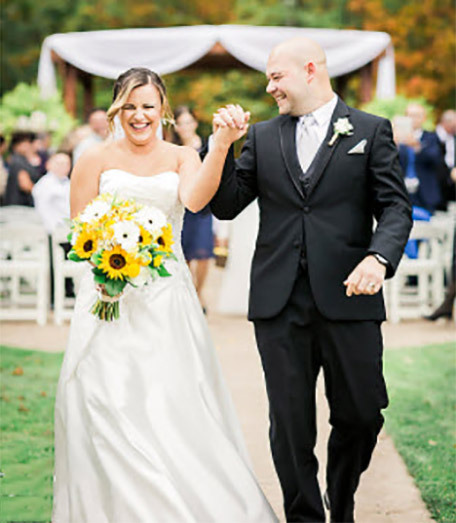 This list will give you an idea of the typical price range for the most commonly ordered wedding flowers. Depending on the complexity of the arrangement and type of flowers, actual prices will differ. Q. Do you deliver the flowers? Yes, we deliver the flowers at an additional delivery cost. We like to deliver the bouquets half an hour before the photographer arrives. We recommend all the boutonnieres go to the ceremony site, so they are fresh for the ceremony. There are additional delivery charges if the ceremony is at another location. Can I pick up the bouquets or centerpieces the day before or morning of to save on the delivery? Yes, but we do not assume any responsibility for wilted flowers. This can happen if they are stored in areas which are too warm or cold. For example, if they are put in a fridge, the blower can make the fridge much colder than the registered temperature. Or if the flowers are left in a hot car while doing errands, they may also wilt. Often couples pay the delivery fee to decrease these worries. 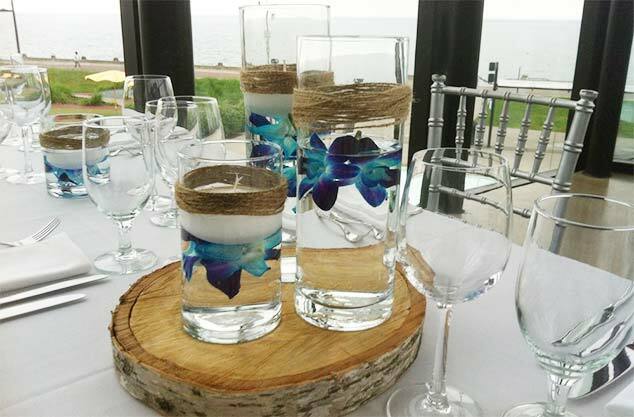 As for the centerpieces and other flowers, we work with the venue as to drop-off time. Q. Do you set up the flowers on the tables or just drop them off? A. We set the flowers on each table to make sure they look perfect in the room.